I’ve finally got everything together to make my first all-grain brew on my new equipment! 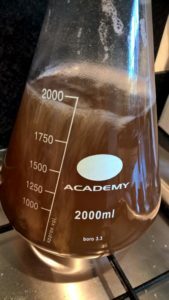 As it turned out really well, I’ve decided to make the all-grain version of the Dirty Daemon extract-based beer I made last November. 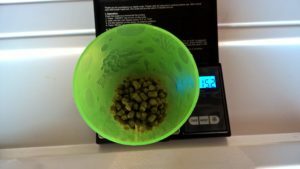 It’s a really nice amber-coloured American Pale Ale with lots of Citra hops and should turn out at around 6.5% vol. On Friday evening I set about preparing a yeast starter, using the Brewers Friends pitching calculator. 24 hours later, chilling in the fridge. 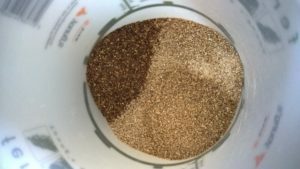 On Saturday evening, I measured out my mash strike & sparge water and following the advice in Bru’n Water, I gave them measured doses of CRS, Gypsum and Calcium Chloride. So, Sunday afternoon soon rolled around and it was time to start! 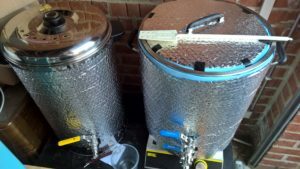 I brought the strike water in my kettle up to the temperature recommended in Beersmith, 73C, and then transferred it into my mash tun. I mixed in my grains and hit upon the first of many snags! As this is my first brew on this equipment, many of the volume & temperature targets were based on presumptions and tests using water. Disaster #1 struck! After adding the grains, my mash temperature was meant to be around 66.5C, but in fact was just under 63. A quick Goggle confirmed that whilst this would increase the fermentable sugars available in the beer, it would also negatively affect the body & “mouth feel”. I made a quick dash to the kitchen and boiled a couple of kettle fulls of water and added it to the mash 1 litre at a time. I’d eventually added 6 litres of boiling water when I’d got it to just over 65C. 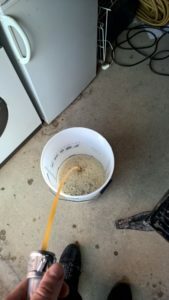 I left it there for an hour, started heating the sparge water to 75.6C and giving the mash a stir every 15 mins or so. I transferred the first runnings into the kettle and turned on the induction plate to start heating the wort up to boiling temperature. Meanwhile, I drained off 6 litres from the sparge water due to the boiling water additions I made earlier, and then prepared to pump the remaining water into the mash tun. Disaster #2 struck! I got an airlock in my pump and in my frustration trying to clear it, I cocked up and opened the tap on the HLT without the pipe attached. 75C water poured out over my hand and across the garage whilst I struggled to get the tap closed. There’s an annoying catch that drops when the tap is over or closed to stop it being moved accidentally – Unfortunately, it totally gets in the way when you’re trying to close the tap in an emergency – That’ll be getting removed soon. 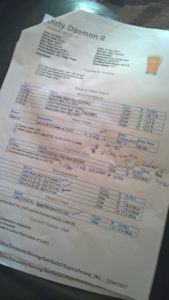 I’ve no idea how much sparge water was lost – Probably a couple of litres. After picking up the HLT and pouring the sparge water into the mash tun, I gave the mash a gentle stir and left it for another 15 mins. 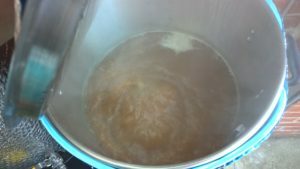 I vorlaufed the sparge water then transferred the second runnings into the kettle and whacked the heat on full blast to bring it up to the boil. 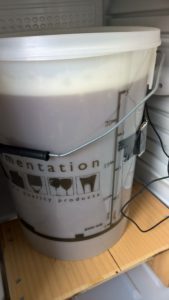 At this point I noted that I had more wort than was estimated – around 3 litres extra! Disaster #3 struck! I wanted to take a hydrometer reading of the “pre-boil” gravity but no matter how hard I looked, I couldn’t find my trial jar! After turning the garage and kitchen upside down, I almost resigned to the fact I wasn’t going to be able to take any gravity readings. At least until I found a tall 1 litre milk bottle – I thorough clean with Oxi & the bottle brush, plus some StarSan later, I managed to get some wort into the bottle and take a reading! Pre-boil gravity came out at 1.034, which seemed really disappointingly low until I remembered I needed to adjust for temperature. After adjustment I estimated the pre-boil gravity at 1.052. During the boil, I had my pump attached and recirculating wort through the whirlpool attachment. Mainly to ensure the pump & pipes were in contact with as much boiling liquid as possible and to try and keep the trub in the centre of the kettle. 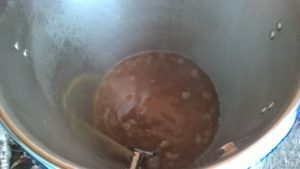 At the end of the boil, I noticed I still had around 3 litres more wort than I should have but decided to press on anyway. 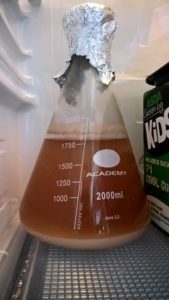 I connected up the immersion cooler and started bringing the wort down to yeast pitching temperature. Disaster #4 struck! Just after whirlpooling started, my pump stopped working! I’m not sure if this was due to overheating or a blockage, but I gave up on it for a while and disconnected it all. I got my paddle out and kept stirring the wort to keep the hot wort moving over the cooler. I managed to drop the temperature by 50C in the first ten minutes, but the last 30 seemed to take forever. After about 20 minutes of stirring, my arm was aching and I decided to check the pump again – The flipping thing was working again! I hooked it all up and got it whirlpooling again, and eventually reached pitching temperature after an hour total. Go little yeasties, do your work! 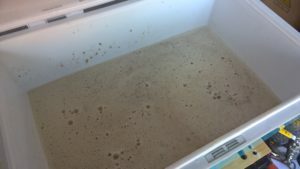 After getting down to around 20C, I pumped the wort into my fermenting bucket ready to add the yeast and pop it into the fermenting fridge. 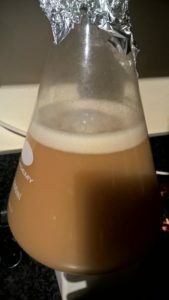 Final gravity came out at 1.062 which is a few points lower than the target of 1.066, but considering I had to leave a couple of litres in the kettle, isn’t too bad overall!